Summer is often a season of danceable mash-ups and kooky collaborations. (Afterall, who would have imagined Snoop Dogg and Katy Perry hooking-up on a track?) In a partnership slightly less-likely to produce a radio hit, Cincinnati’s finest Fine Arts performance organizations have teamed up, with members of the Cincinnati Ballet dancing in the Cincinnati Opera’s performance of Die Meisteringer von Nurnberg, the lone comedy created by Richard Wagner. This production opens the 90th Anniversary Season for the Cincinnati Opera, and comes on the heels of a scintillating season finale for the Cincinnati Ballet. Performing The Sammy Project! 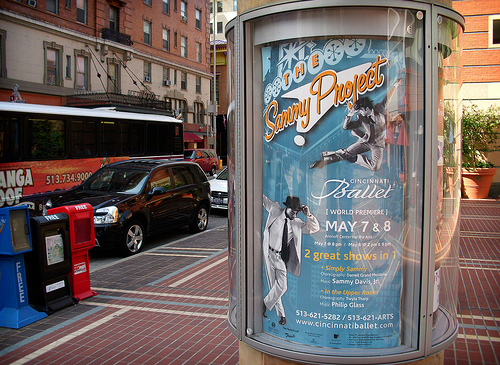 in early May at the Aronoff Center for the Arts, the Ballet showcased the world premiere of Darrell Grand Moultrie’s The Sammy Project! and a performance of dancemeister Twyla Tharp’s (Nine Sinatra Songs, Broadway’s Movin’ Out) In the Upper Room. The works were prefaced by For Kristi, a biographical work telling the story of company member Kristi Capps and her time with the Cincinnati Ballet; her retirement after that night’s performance would conclude a fourteen-year-long relationship. Here, I confess that despite an affection for dance, my knowledge doesn’t extend much beyond being able to identify the odd grand jete’. But here, I found, was the show for me. Set to classic Sammy Davis Jr. tunes that oscillated between brassy, buzzing, and sultry, Moultrie’s choreography in The Sammy Project! took his dancers through acrobatic and explosive combinations that did not seem so far removed from mainstream dance television such as So You Think You Can Dance? With memorable music, jazz-inspired steps, and stylish costumes inspired by the Rat Pack-era — untied bow-ties often straddled male necks with gem-colored shirts and cocktail dresses the rule of thumb, throughout — there seemed an almost palpable exuberance on-stage and in the house. And while restraint may not have been the chief strength of the piece, Moultrie staggered and layered the entrances of his dancers — who very often operated in couples for entire dances — as they joined and subsequently left geometric formations, adding much-needed dynamics with a sort of visual crescendo and diminuendo. Watching In the Upper Room, a work by Twyla Tharp consisting of a single, extended piece, one could still see something of the tide-like entrances and manic energy brought to bear in Moultrie’s work. However, where Moultrie aimed for ebullience, Tharp seemed committed much more toward the cryptic: owing much of its emotional shape to Phillip Glass’s beautifully expansive and cascading score, In the Upper Room is constructed like an Escher sketch. Calling for twitchy little jumps and mechanical lines from the performers, Tharp’s choreography repeats entrances, steps, and blocking until they begin to coalesce into a slowly-emerging, discernible pattern. Then, introducing the smallest variation in that pattern, Tharp disturbs the complex orbits she has set in motion, deconstructs them, shifts small segments around, and then resets whole thing, to start up again. New variations are introduced each time, and the work seems almost to expand as it moves forward. The choreography is quirky, with limited vertical movement, and more scurrying about than big, graceful movements. But as fog is pumped across the stage and begins to inhibit visibility, dancers soon are materializing from upstage as if from thin air, one after another, each a surprise. The fog eventually obscures the proscenium, that divide between the stage and the seats, and with so much action along the “Z”-axis and one’s mind trying to decipher Tharp’s puzzle of patterned movements, a pattern that always seems about to be understood, even as it resists solving, one begins to feel pulled into this dreamlike world. If The Sammy Project! takes one’s breath away with thrills and joyfulness, In The Upper Room achieves the same end with mystery, intrigue and rapture. It creates a sensation somewhere between drifting to sleep and drowning at sea. For neophytes, this season finale provided a near-ideal buffet of ballet: a navigable narrative, an accessible, multifarious revue, and an engaging but slightly more abstract work. Additionally, by showcasing a new piece by an up-and-comer, alongside both locally produced work, and dance imagined by one of America’s preeminent modern choreographers, the Cincinnati Ballet closed 2009/2010 with a useful sampler, hinting at the breadth of what one might expect to see in the coming season. Those anxious to indulge in some classic performing arts during the Cincinnati Ballet’s summer hiatus, were able to enjoy the final performance of Cincinnati Opera’s Die Meisteringer von Nurnberg on Saturday, June 26. Information on the rest of the 2010 season can be found at CincinnatiOpera.com, while information on the upcoming Cincinnati Ballet season can be found at CBallet.org.